This week, all of us here at Norwood have enjoyed supporting Children’s Mental Health Week. This year’s theme – Healthy: Inside and Out – is something the dedicated and highly trained team here at Norwood understand the importance of only too well. It goes without saying that our minds and bodies are connected, you need to treat them both well to really feel the rewards. There are a few simple things you can do to encourage your children towards a healthy body and mind, such as getting the recommended amount of sleep for their age group, eating a well-balanced diet and getting regular, gentle exercise. Sensory toys are amazing. Try something bright and colourful with fun textures to explore; if you can find toys that vibrate, even better. Simply letting your child hold the toy can be enough. For a non-mobile child, it is a wonderful sensory experience and will offer them a variety of sensations. For children with autism, it can be a great calming tool and offer something to focus on and distract from potential difficult behaviours. Cooking is another sensory activity that children love, not just for the joy of getting messy and feeling all the different textures, but because there’s an end result – cake. And who doesn’t love a warm piece of homemade cake? Taking our child for a walk is great for them regardless of whether they need a wheelchair or not and they will enjoy it for the very same reasons an able-bodied child would: it’s a change in environment. Going for a walk can also get rid of agitation and help calm them down. In short, breathing in the fresh air and getting a change of scenery will do wonders for the whole family. Hand or foot massages can be relaxing and offer the body some well-earned TLC, especially if it means your child gets to sit or lie in a comfortable position which is different to the rest of the day. Let the massage be led by your child, though: if they get agitated, don’t persevere, have a break and try something else. Music plays a big part in our activity schedule here. We don’t just listen to music, oh no. Everything is very person-specific, though. One person might like to bang on the drums and another might like to sit in a quiet room and listen to a nice song. Dressing up can be fun. Again, this is very sensory-led and definitely something for the whole family. We have a few tiaras and dress-ups and we just have a bit of fun with it. You will laugh a lot, and guess what… that is great exercise. Try it at home – it’s an activity everyone can get involved in. Everyone’s needs are different and what works for one child won’t for another. Be patient and try a few different ideas. By looking after your child’s physical health, it will have a positive impact on their mental health. Never be afraid to seek out the advice of the professionals. Norwood has a multidisciplinary team of highly skilled and experienced people working for them who are just a phone call away. 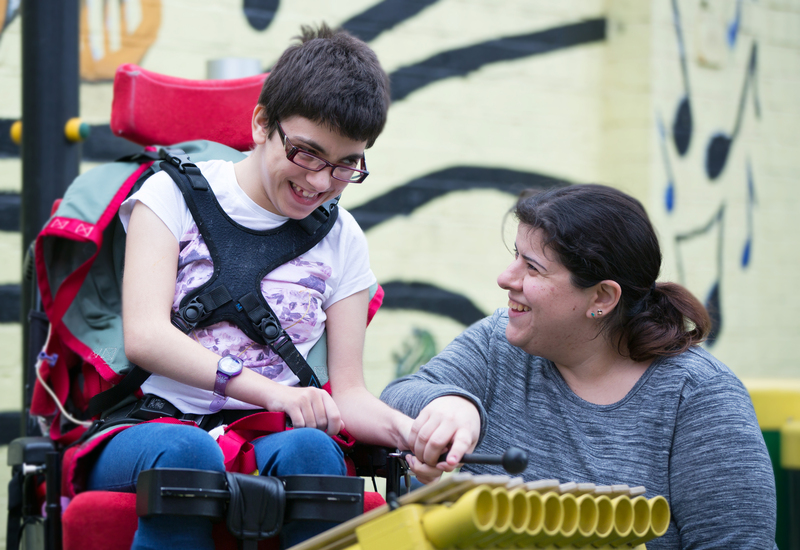 *Buckets and Spade is a unique service which, for the past 20 years, has provided overnight, weekend or longer stays for children and young people up to the age of 18 who have multiple, complex and sometimes profound disabilities and other health needs.